It’s common to hear the phrase “tradition of excellence” around many of Stanford’s athletic programs. But what’s not common is for that tradition to have started along with the inception of a sport. Stanford’s women’s volleyball program is just one of two teams to have appeared in every NCAA tournament since volleyball officially was added to the NCAA championship program in 1981. It has appeared in more title games (14) than any school in the country, and no team has won more than its six national championships. That tradition of excellence has continued with this year’s team, which started the season with a program-record 28 consecutive victories. It’s a balanced team that is strongest at the middle blocker position, but one that consistently gets strong contributions from all six players on the floor. Their confidence and composure in crucial moments has earned them a 5-0 record in five-set matches, and is a huge reason why they were able to bring home the program’s 19th conference championship. It’s no wonder why they’re the No. 1 overall seed heading into the NCAA tournament. While the Cardinal have not been able to bring home a national championship since 2004, this team has been simply dominant. And much like the San Francisco Giants, who have won the World Series in each of the last three even-numbered years, Stanford looks to take advantage of a quirk of their own: they won the title in 1994 and 2004. This must be the year, right? Here’s a look at those two championship teams that played key roles in building the program’s tradition of excellence. The similarities between those two teams and this year’s squad may make a national title more likely than the “every 10 years” fluke may have it seem. Despite making an early exit in the third round of the 1993 NCAA tournament and entering the season with three freshmen in its starting lineup, expectations were still high for Stanford’s 1994 squad, which was ranked first in the nation in the coaches’ preseason poll. While the word “balanced” has often been used to describe this year’s team’s offense, the 1994 championship team was built on getting contributions from up and down the roster. Hitting attempts were split relatively evenly amongst the starting lineup, due to the Cardinal’s unique offense that took advantage of their players’ versatility. While the 6-2 offense (six attackers, including two setters) has become more rare as the game has evolved — particularly after the change from side-out scoring to rally scoring and the substitution rules that were transformed along with it — Stanford was able to run the scheme to a tee. Head coach Don Shaw utilized many of the starters’ abilities to play both the front and the back row and was not afraid to use his bench in key situations. In fact, Shaw noted that perhaps one of the reasons none of his teams finished undefeated is that he wasn’t afraid to put in his non-starters in crucial games for them to gain experience. 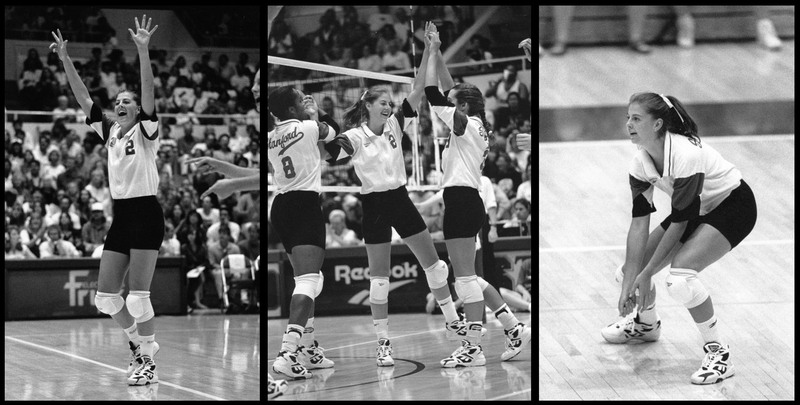 Stanford rattled off 20 consecutive victories to begin its regular season — much like the early success of this year’s team — but the 1994 squad did so in even more dominant fashion, losing just four sets over the winning streak. The run of dominance came to an end in Los Angeles, as the Cardinal dropped an ugly five-set match to UCLA. Shaw unequivocally called the performance Stanford’s “worst match of the year” in an interview with The Daily shortly after the match, as the team committed a season-high 39 errors and hit a season-low .173. That confidence carried Stanford through the rest of its regular season, starting with a five-set win at USC on the day after the crushing loss in Westwood. The Cardinal dropped just two sets combined over the rest of the year after the road trip to Southern California, winning 11 consecutive matches en route to clinching the national title. This year’s squad hopes that after a loss to Washington in the regular season’s final week ended its hopes of going undefeated, it can rebound as well as the 1994 team did after its goal of perfection was similarly derailed. It was only fitting that Stanford would meet UCLA in the championship match of the 1994 NCAA tournament a little over a month after losing its only match of the season to the Bruins. Because the sport lacked its modern-day parity, the rivalry between the two programs had been building for years. The Cardinal had matched up against the Bruins in the postseason in each of the previous four seasons, and had only beaten them once in that stretch — in the 1992 championship match — after the Bruins had gone on to win the tournament in 1990 and 1991. However, that Stanford win in the 1992 final in Albuquerque started to turn the rivalry on its head, with some gamesmanship from Shaw providing the impetus. That season, after the Cardinal had lost the first meeting between the teams at the start of October in a five-set match that ended 16-14, Shaw had a plan for when his squad traveled down to Los Angeles for the rematch. So from then on in the 1992 season, the Cardinal ended every practice with a half hour of “Bruin time,” exclusively dedicated to preparing for a potential matchup against UCLA in the title match. The plan came to fruition when the teams met in the championship match, just as Shaw had predicted, and the Cardinal came out on top in a four-set win over the two-time defending national champions, earning its second title in program history. That match proved to be the beginning of the end of UCLA’s volleyball dynasty, and the 1994 championship match was the proverbial straw that broke the camel’s back. It was an ugly match, to say the least. Stanford hit just .175, managing just 86 kills on 229 total attacks. UCLA posted just a .172 hitting percentage, with 81 kills on 232 attacks. UCLA didn’t reach another Final Four until 2006, while the Cardinal went on to win the 1995 and 1996 titles as well. Even more biting for the Bruins was that it was Stanford’s freshman class — headlined by Sharpley, Kristin Folkl and Barbara Ifejika — that went on to lead the program to win three championships in a four year span, the first time in the history of the sport that happened. All three of those players were deciding between Stanford and UCLA at the end of their recruiting process, and in one of the most consequential swings of good fortune in both programs’ histories, all of the dominoes fell the Cardinal’s way. While the 1994 team was loaded with talent and simply overmatched every opponent it played that season, save for the two losses to UCLA and the tight victory over USC, its chemistry was crucial to its success as well. That dynamic was built by the many strong personalities and natural leaders that the team had. One of those players that set the tone was Eileen Murfee. Senior captain Anne “Slick” Wicks was another indispensable leader on the team and had a particularly crucial role in Stanford’s performance in the Final Four, despite being pulled from the championship match after struggling in the first couple of games in what Shaw called one of the toughest decisions in his coaching career. “In the huddle, Slick told us, ‘You guys, this is the moment, there’s no other time to do it.’ I played off of what she said and realized that this is for fun. I tried to smile and not take it for granted,” said Marnie Triefenbach after the championship. “I was just trying to get them to loosen up, to be glad we were where we were, glad we could do what we were doing,” Wicks said. The 2014 team is eerily similar to the 1994 squad in terms of getting contributions from a variety of players on the roster — both strong play on the court, and key leadership in huddles on and off the court. The only thing that remains to be seen is if they have the drive and confidence that characterized the 1994 team to last all the way until the final match of the season in Oklahoma City. While the 1994 championship team was built on its depth and offensive contributions spread amongst a variety of players, Stanford’s 2004 championship team was as different as you could imagine. For this group, the team’s success depended on the offensive prowess of one player, and once the entire team learned how to take advantage of her talents — it took about half the season to effectively do so — the Cardinal became unstoppable. And the reason why it took so long was because this not-so-secret weapon missed the preseason because she was busy winning a silver medal with the U.S. national team at the Summer Olympics in Athens. The morning after the closing ceremonies in Athens, Nnamani boarded a flight to meet her collegiate teammates in Nevada for their season-opening tournament. However, it took time for her to find her stride on the court, as she was such a crucial member of the Cardinal offense who had been absent for all of the preseason and she was fatigued from training and competing with the Olympic team throughout the summer, then- and current head coach John Dunning noted. As a result, Stanford struggled to start the season, going 15-6 through the midpoint of conference play. The team stagnated until the weekend before Thanksgiving break, when a single home match against Washington turned the season around. After being swept by the Huskies in Seattle just three weeks prior, Stanford quickly dropped the first two sets at Burnham Pavilion; Maples was under construction for the duration of the season. The Cardinal saved 11 total match points in battling back from a 29-26 deficit in the fourth set and a 14-11 deficit in the fifth set to take the match, finally figuring out how to fully utilize Nnamani’s talents. Nnamani finished the Washington match with 37 kills, the fourth-most in a single match in program history, and from that point on, she became the focus of her team. Shaw, who recruited her toward the end of his coaching tenure with the women’s team — he went on to coach the men’s team for seven seasons before retiring — said that he had never seen anything like what happened after the midpoint of that season. “That was what she needed to do in the first place — just take over. She’s such a nice person that she didn’t want to take all of the attention,” Shaw said. “Suddenly, in that [Washington] match, she just went nuts. From that point on, Bryn Kehoe proved what a smart player she was: She just set Ogonna the rest of the year. Nnamani’s humility was evident in a recent interview, 10 years after the championship season, as she quickly deflected praise onto her teammates. The Cardinal finished their regular season with nine consecutive victories, but due to their early-season shortcomings, were seeded No. 11 in the NCAA tournament. That ranking grossly underestimated the team’s confidence and standing heading in, after they had only lost four sets over the nine-match winning streak. The team’s toughest test in their tournament run came in the second round, when they faced No. 13 Florida on their home court. The Cardinal were down two games to one and 20-17 in the fourth set before the momentum completely swung when Dunning called a timeout. “I knew that the season was coming to an end and I said, ‘I don’t want the season to end here. We’re too good for it.’ So I just got into survival mode. I was going to do whatever I could, whatever was possible for us to win,” Nnamani said. “I said, ‘There is no way we’re going to lose.’ And everybody else on the team had that mindset that there was no way we were going to end our season there. After the timeout in the second round match in Florida, Stanford went on to win the fourth set, 30-27, and then the fifth set, 15-9, after winning nine of the final 12 points in the match. That comeback set the team on a roll, and they did not face much adversity the rest of the way en route to their championship. The Cardinal played Minnesota in the national championship match in Long Beach, and despite facing early deficits in each of the three games, secured the program’s sixth national title with a sweep, 30-23, 30-27, 30-21. Nnamani earned National Player of the Year honors for her historic season in which she almost singlehandedly led Stanford to a national title. She finished with 823 kills — an average of 6.19 kills per set — besting the previous program record of 627, which she set one year prior. 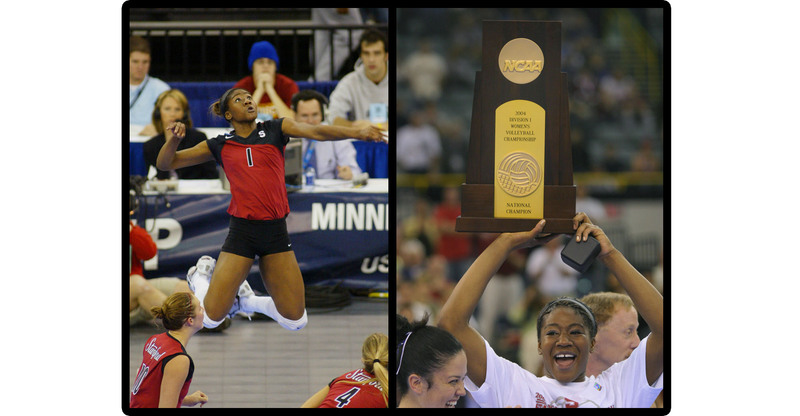 Nnamani’s 165 kills in the 2004 tournament still stands as the NCAA record. While Stanford’s women’s volleyball program hasn’t won a national title since that 2004 team made its improbable run and it hasn’t reached a Final Four since 2008, this year’s squad is looking to maintain the streak of winning championships on years ending with fours, taking advantage of some key commonalities that it shares with both the 1994 and 2004 teams: they are all confident groups composed of players with strong personalities. “This program is built on lots of things, and one of them is winning national championships, and we’re grateful for that — to be part of it and to be part of that history,” said Dunning, now in his 14th season at the helm of the Cardinal program. “But for me, I think I’ve matured in my life: I just like going year-to-year. I know what the goals are and I know what the expectations are, but I’ve got to deal with it in a way that makes it so that it’s a great experience no matter what happens.